An outdated NASA satellite, which has been adrift in orbit for six years, is falling back to Earth, and some of its debris is expected to reach the ground in the next few weeks. But despite the chance that bits of debris could land in North or South America, the space agency is assuring the public that there is no reason to be alarmed. NASA's Upper Atmosphere Research Satellite (UARS), a school bus-size spacecraft, will re-enter Earth's atmosphere sometime in late September or early October, agency officials said. Debris from the satellite could fall over a swath of land stretching more than 500 miles (804 kilometers) anywhere between northern Canada and southern South America. Narrowing down the area of impact will not be possible until much closer to when the pieces will hit, said Air Force Maj. Michael Duncan, deputy chief of the U.S. Strategic Command's space situational awareness division. On average, one moderate-size object, which could be an old, intact spacecraft or rocket body, falls to Earth every week. 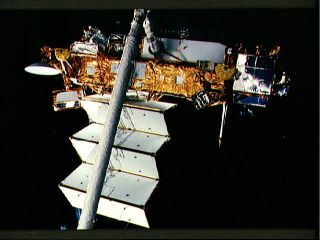 The majority of the debris disintegrates upon re-entry into Earth's atmosphere, but some of the vehicle components do reach the surface, Johnson said. These pieces of space junk typically fall over broad ocean areas or desolate regions like the Australian outback or the Canadian tundra. Regarding larger objects such as the nearly 12,500-pound (5,668 kilograms) UARS, the U.S. Space Surveillance Network typically sees one of these re-entering the atmosphere per year. "Last year there were 75 metric tons of spacecraft and rocket bodies falling back to Earth in an uncontrolled manner," Johnson explained. "In perspective, UARS is less than 6 metric tons, so it's a very small percentage of the annual re-entry of satellites into Earth's atmosphere." Even when pieces of defunct satellites and rocket bodies do reach the ground, the chances of them posing a risk to people and their property is very remote, NASA said. NASA and the U.S. Space Surveillance Network has closely studied the satellite to determine the potential risks during its re-entry. Current projections show that 26 large pieces, totaling approximately 1,170 pounds (532 kg), will survive the trip through Earth's atmosphere. Still, the chances of the UARS satellite causing any real harm is very small, officials said. "Throughout the entire 54 years of the Space Age there has been no report of anyone being injured or impacted by any re-entering debris," Johnson said.